Currently, there is no real-time data available on air quality from the vast majority of remote oil and gas well locations. To help the oil and gas industry manage their well sites, Project Canary created a sensor system to take measurements of air quality and report the data to the Losant Cloud. Notifications trigger automatically, allowing the production companies to efficiently respond and correct problems. Project Canary, a startup based in Denver, Colorado, was created to help reduce the unintended release of natural gas into the earth’s atmosphere. Natural gas is primarily methane which is some 80 times more effective at trapping heat in the atmosphere than CO2. 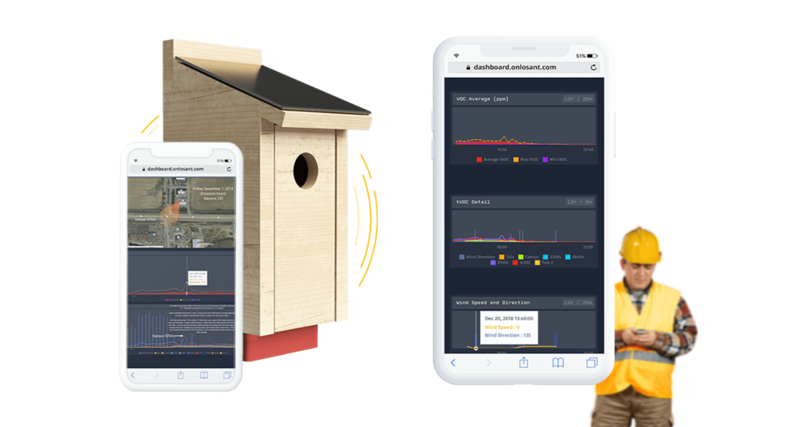 Project Canary uses an IoT solution which continuously gathers real-time air quality data that will help industrial customers curtail emissions, avoid fines, and protect the environment. Natural gas leaks at oil and gas production sites result in millions of dollars in fines for oil and gas companies as well as lost revenue and damage to the environment. The challenge is that methane, the primary constituent in natural gas, is lighter than air, odorless, and invisible. There are few options for effectively monitoring leaks. Until Project Canary was developed, the only way to detect the presence of a leak was to physically inspect each producing site with an expensive, highly specialized infrared camera. There are more than 1.2 million producing wells in the United States. Inspecting every site is expensive and inefficient. Furthermore, many of these leaks are intermittent, occurring when systems become over-pressured and cease to function as designed. During normal operations, a natural gas well produces no significant emissions. A field inspector could inspect and certify a well only to have it begin leaking hours later, releasing thousands of cubic feet of natural gas into the atmosphere. The Project Canary device consists of a small solar panel mounted on the roof of an actual bluebird house. This panel charges a lithium battery that powers a microprocessor connected to a cellular network. Project Canary engineers have modified these sensors, which were originally designed to monitor indoor air quality, and have optimized them for outdoor application at industrial facilities. This new generation of sensors is exceptionally stable, power efficient, and sensitive to atmospheric contamination levels at parts per billion. Losant has been fabulous for rapidly digesting and visualizing IoT data. I am still discovering new ways to use it for large-scale deployments. Because the solution required reports and a dashboard through which clients could access their information from anywhere, Project Canary’s team selected the Losant Enterprise IoT Platform which came equipped with the End-User Experiences capability. The proof of concept came together quickly, using the Losant App Builder to sift through the telemetry data. Losant Dashboards were used for time series charts and other graphs. The Losant Experience builder allowed the Project Canary team to quickly implement authentication, user management, and REST endpoints that customers can use to stream data to their internal systems. The most important engineering breakthrough came from the application of sensors that were designed for indoor air pollution monitoring. The VOCs associated with natural gas are detectable at ground level, and the Project Canary team was one of the first groups to realize that they could be used as a proxy for leak detection. Integration of real-time meteorological data, particularly wind direction and speed, allows the algorithms implemented within the Losant Cloud to differentiate ambient atmospheric conditions from actual natural gas leaks. The Losant workflows then generate notifications that allow energy companies to efficiently respond and rectify any problems at their well sites. Project Canary is pioneering a new generation of low cost, real-time, solar-powered environmental monitoring sensors. The company is helping the energy industry assure the safe, efficient, and environmentally responsible operation of the more than four million oil and gas wells around the globe. A PDF version of this case study is available for direct download. Want to understand more about what you can do with the Internet of Things? See our IoT Checklist for Proof of Concept Success. Schedule a demo with our team to learn more about the Losant Enterprise IoT Platform.